The slides converter tool in your Docebo LMS allows users to convert PDF, ODP, PPT and PPTX files into a sequence of snapshots that can be played inside your Docebo platform without needing to download the presentations to a user’s device. 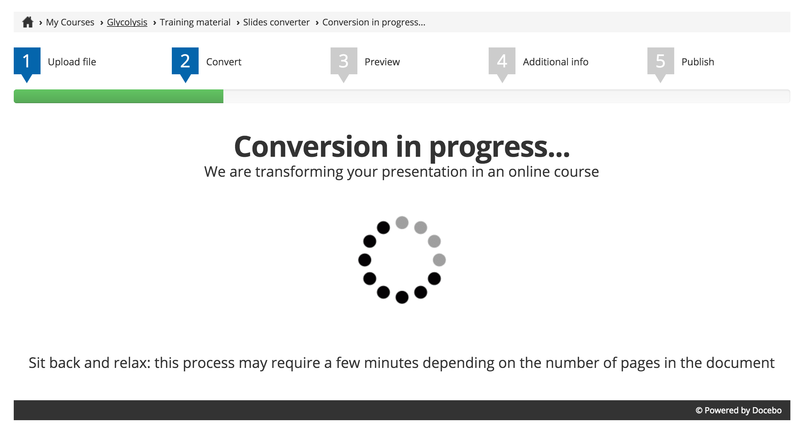 To upload and convert a presentation, access the Admin Menu from the left sidebar, then press the Courses item from the E-Learning Section. Then, on the main Courses Management page, find the course in the list of courses for which you would like to upload a presentation. In the course’s row in the list, press the menu icon on the far right. Then, from the dropdown menu, select the Training Materials item. 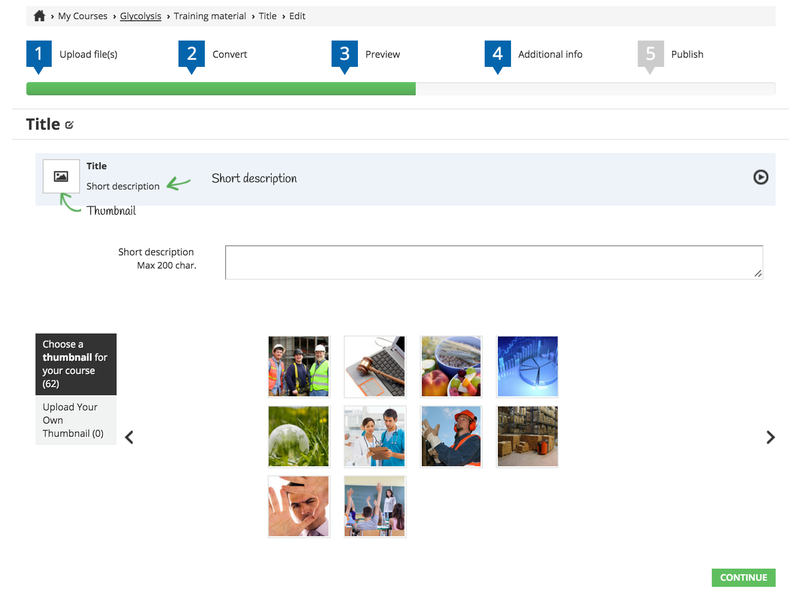 On the main training materials page, press the the Add Training Materials button on the right. From the dropdown menu, select Slides Converter. On the upload page, you can upload the file from your documents or just drag the file into the upload area. Please adhere to the note on the page: If your presentation is more than 150 pages or slides, you should split the file into two or more smaller files so you don’t run into problems or delays when uploading your file. A presentation should have a maximum of 150 pages or slides. Once you upload the file, you will see the Conversion in Progress… message. Please note that the number of slides in your file impact the time it takes to complete the conversion process. Once the preview of your project is displayed, you can insert a title by selecting the Authoring Title icon, as shown in the picture below. Insert title in the box, then select Continue at the bottom of the page. 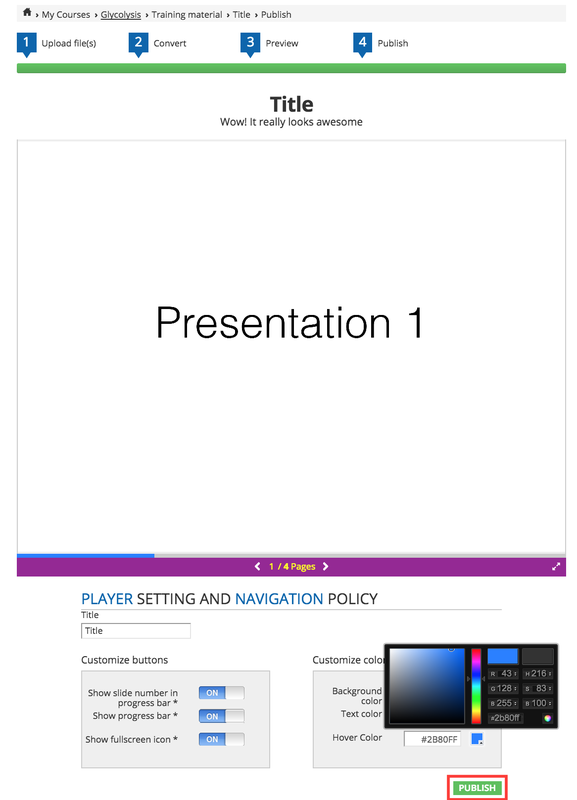 Then, add a short description for your presentation as well as a thumbnail. You can choose from one of the thumbnails already in the system, or upload your own. Press Continue when finished. Furthermore, customize buttons by displaying the slide number and the full screen icon. You can also customize the color of the progress bar, the text, and the hovered section of the screen. The bookmark feature allows users to restart presentation from the last slide seen. Please note that Bookmark feature is always active. There is not a way to disable this option for users. 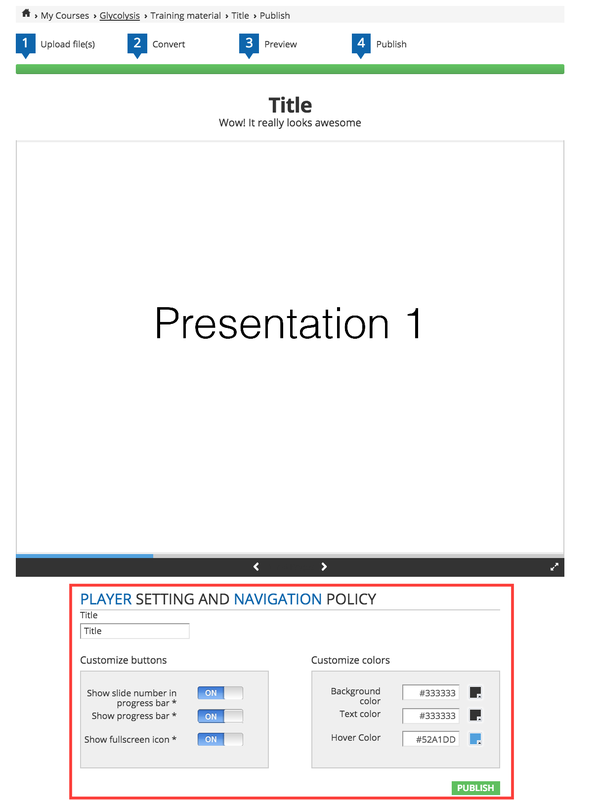 Now, you can save and publish your presentation. The presentation is now available in the Training Materials Area. You can edit or delete it as necessary, or switch to the Learner View using the toggle in the top right section of the screen to see how to presentation is displayed to your learners. Please note that the learning object will be marked as complete when the last slide is viewed. If you have a long presentation, we suggest you to divide it into at least two objects in order to make it more manageable the end user. If your presentation contains multiple animations, we suggest you simplify it and make sure that the end result is exactly what you need. Also, remember that animations are not uploaded into the LMS, but are returned only as a snapshot. 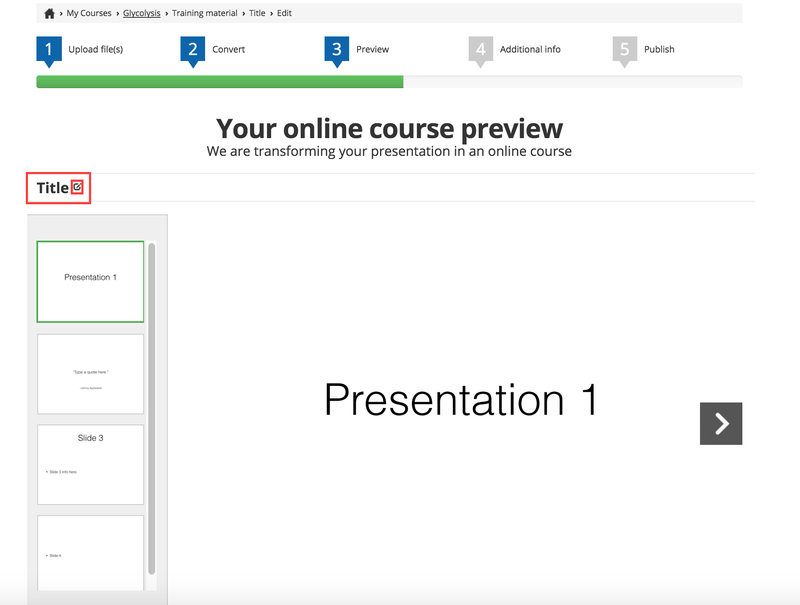 If you need to upload an edited version of the presentation, you can do so by selecting the Edit icon in the learning object’s row on the main Training Materials page for the course or from the Central Learning Object Repository, then uploading the new file. The data for the learning object will remain the same in your platform. Please note that Slides Converter learning objects do not support versioning if they are in the CLOR.